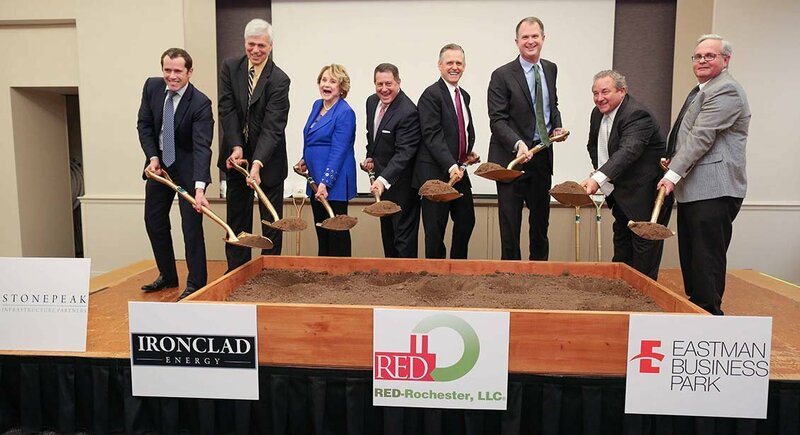 Congratulations to RED-Rochester, LLC., IronClad Energy Partners and StonePeak Infrastructure Partners on their successful groundbreaking event at Eastman Business Park. On November 2, 2016, over 100 people, including Congresswoman Louise Slaughter, NYS Assembly Majority Leader Joseph Morelle, John Prunkl, CEO Ironclad Energy Partners, LLC and Jeffrey Clarke, CEO Eastman Kodak Company gathered to celebrate the event. Eastman Business Park will be completely coal-free for the first time in over 100 years. CO2 emissions will fall by 50%. Overall fuel efficiency will improve. The RED-Rochester steam plant will be fully modernized, setting the stage for another 100 years of success at Eastman Business Park. Efficiently using lower cost fuels will ensure competitively priced, reliable utility services. We at Kodak and Eastman Business Park are thankful for the support of all of our elected officials and community leaders for your unwavering commitment to Kodak and to Eastman Business Park. We also thank the employees of RED-Rochester who are responsible for the day-to-day reliability of the utility assets. Most of you have been here at Kodak Park and EBP for more than 20 years! These are folks in operations, maintenance and technical support teams for steam-electric, refrigeration-water, King’s Landing, and sub-surface and metering. The support we’ve received, especially through the Finger Lakes Regional Economic Development Council— designating Eastman Business Park as one of the region’s top priorities – is a true testament to the strong asset we have here in Rochester.